Over recent decades, sulfur fumigation is becoming abused in processing some freshly harvested herbs used as both medicine and food, although it has been questioned whether sulfur fumigation will change the efficacy and safety of the herbs. One of the herbs commonly processed by sulfur fumigation is Platycodonis Radix (Jiegeng in Chinese). Glycosides are the main bioactive components of Jiegeng. Up to the present, no study has been carried out to evaluate the impact of sulfur fumigation on glycoside profile of Jiegeng. A rapid and versatile ultra-high performance liquid chromatography coupled with ultra-high resolution quadrupole time-of-flight mass spectrometry (UHPLC UHD Q-TOF MS/MS) method was developed for comprehensive analysis of the glycoside profiles of sulfur-fumigated and air-dried Jiegeng samples. Twenty-three glycosides were detected in air-dried and sulfur-fumigated Jiegeng samples. After sulfur fumigation, the peak heights of eight glycosides, namely platycogenin A, platycodin D, platycodin D2, platycodin D3, polygalacin D, polygalacin D2, deapio-platycodin D and 3″-O-acetylplatycodin D2, remarkably decreased; while peak heights of five glycosides, namely syringin, lobetyolin, platycoside E, deapio-platycodin D2 and deapio-platycoside E, slightly increased; in addition, peaks of ten glycosides, platycodin A, platycodin C, platycodin V, platycoside C, 16-oxoplatycodin D, 2″-O-acetylpolygalacin D, 2″-O-acetylpolygalacin D2, 3″-O-acetylpolygalacin D, 3″-O-acetylpolygalacin D2, and platycogenic acid B, disappeared. Sulfur fumigation caused significant changes of glycoside components of Jiegeng. Further investigations are warranted to explore how these chemical changes occurred and whether these changes would affect the efficacy and safety of Jiegeng. Herbs used as medicines and/or foods need to be processed after harvest. One of the processing methods is sulfur fumigation, which was first applied in preparing a processed form of Dioscoreae Rhizoma (Guangshanyao in Chinese), in Henan province, China, in 1900. The sulfur dioxide (SO2) generated during sulfur fumigation can bleach the herbs, and kill contaminated/parasitical microbes and insects on the herbs thus prolonging shelf life of the herbs. However, sulfur-fumigation would inevitably change the chemical components in the herbs. Recently, the disadvantages of sulfur fumigation have drawn much attention in Chinese medicine and food sectors. Since 1995, the number of sulfur-fumigated herbs has been gradually reduced in individual editions of Chinese Pharmacopeia (CP), and the sulfur-fumigation method for processing Chinese materia medicas (CMMs) was abolished in the 2005 edition of CP. Due to the benefit of sulfur fumigation on prolonging shelf life of CMMs, some CMMs were still processed by sulfur fumigation after CP2005 was issued. In CP2010, the limits of SO2 residue on sulfur fumigated herbs were settled. Nevertheless, some reports have shown that sulfur fumigation could cause dramatic changes in chemical profiles of various herbs [1–8]. Platycodonis Radix (the dried root of Platycodon grandiflorum, Jiegeng in Chinese), a Chinese medicinal herb traditionally used for dissipating phlegm, is commonly processed by sulfur fumigation. To the best of our knowledge, no study has been conducted to evaluate the influence of sulfur fumigation on the chemical constituents of Jiegeng. Glycosides are the main bioactive constituents of Jiegeng, responsible for a diversity of bioactivities such as anti-inflammation, anti-allergy, antitumor, augmentation of immune responses, anti-obesity, and anti-hyperlipidemia [9–13]. In this study, we compared the compositions of glycosides in sulfur-fumigated and air-dried Jiegeng samples using a newly developed ultra-high performance liquid chromatography coupled with ultra-high resolution quadrupole time-of-flight mass spectrometry (UHPLC UHD Q-TOF MS/MS) method. The UHPLC with sub-2-μ liquid chromatography provided strategies to improve resolution while maintained or even shortened the overall run time. Q-TOF MS enabled automated exact mass measurement of precursor and production spectra for structural elucidation with high confidence. The UHPLC UHD Q-TOF MS/MS offered superior chromatographic resolution with exact mass measurements for both MS and MS/MS modes. Acetonitrile is of LC/MS grade (Fisher Scientific, Pittsburgh, PA, USA) and formic acid is of HPLC grade (Sigma-Aldrich, St. Louis, MO, USA). Ultra-pure water was prepared using a Milli-Q Plus water purification system (Millipore, Billerica, MA, USA). All other reagents used for extraction are of analytical grade. The reference compounds syringin, lobetyolin, platycodin D, platycodin D2, deapio-platycodin D were from Sichuan Wei Keqi Biological Technology Co., Ltd. (Sichuan, China). Sulfur, complied with the Chinese Pharmacopoeia (2010 edition), was obtained from the Chinese Medicine Clinic of Hong Kong Baptist University. Stock standard solutions of syringin, lobetyolin, platycodin D, platycodin D2, deapio–platycodin D (each about 1 mg/mL) were separately prepared in methanol and were stored at 4 °C before use. A mixed reference standard solution was prepared by mixing and diluting the five stock standard solutions with methanol to get a concentration of 0.1 mg/mL for each standard. The solution was filtered through a 0.45 μm PTFE filter prior to UHPLC UHD Q-TOF MS/MS analysis. Fresh Jiegeng samples were collected from Inner Mongolia Autonomous Region, China. The identities of Jiegeng samples were authenticated to be the root of Platycodon grandiflorum by morphological methods according to the monograph in CP2010 by Dr. Zhi-Ling Yu. The voucher specimens were deposited in the Technology Development Division, School of Chinese Medicine, Hong Kong Baptist University. Sulfur-fumigated Jiegeng samples were prepared separately from two batches of fresh Jiegeng samples according to the following procedures: 10 g of sulfur powder was heated until it was burned. The burning sulfur and 100 g of fresh Jiegeng slices (2–4 mm in thickness) were put into the lower and upper layers of a desiccator, respectively. The desiccator was then kept closed for 12 h. The sulfur fumigation was repeated twice with each 10 g of sulfur powder. After fumigation, the sulfur-fumigated Jiegeng slices and its corresponding fresh Jiegeng slices were air dried in a fume cupboard for 6 days. The SO2 residues in sulfur fumigated Jiegeng samples were determined to be around 0.43 g/kg following the method described in CP2010. All samples were first homogenized, pulverized in a mill, and passed through a 20-mesh sieve before analysis. The powdered sample (4.0 g) was accurately weighed in a 150 mL conical flask and extracted once with 40 mL of water by sonication (240 W) for 30 min. The extract was filtered and the supernatant was transferred to a 200 mL round-bottomed flask. The extraction procedure was repeated twice. All the extracts were combined and evaporated to dryness at reduced pressure in a rotary evaporator. The residue was dissolved in 16 mL of methanol. Diethyl ether (35 mL) was added to the methanolic solution and the precipitate was collected. The collected precipitate was extracted with methanol for three times (16, 8, 3 mL). The combined methanol extracts were evaporated to about 10 mL. The methanolic concentrate was washed twice with 35 mL of diethyl ether each time. The methanolic fraction was then transferred to a volumetric flask (10 mL) and was made up to the mark with methanol. All samples were filtered through a 0.45 μm PTFE membrane filter prior to UHPLC UHD Q-TOF MS/MS analysis. The UHPLC conditions for LC–MS analysis were as follows: chromatography was performed on an Acquity UPLC HSS T3 C18 column, 2.1 × 100 mm i.d., 1.8 μm (Waters Corp., Milford, MA, USA); and the column temperature was maintained at 40 °C. A gradient elution of solvent A (Milli-Q water with 0.1 % formic acid) and solvent B (acetonitrile with 0.1 % formic acid) was applied as follows: 0–5 min, 10–20 % B; 5–10 min, 20–23 % B; 10–15 min, 23 % B; 15–18 min, 23–27 % B; 18–26 min, 27–32 % B; 26–26.1 min, 32–100 % B; 26.1–30 min, 100 % B. An equilibration period of 4.0 min was used between individual runs. The flow rate was 0.35 mL/min, and the injection volume was 0.5 μL. An Agilent 6450 UHD Accurate-Mass Q-TOF mass spectrometer (Agilent Technologies, Santa Clara, CA, USA) was connected to the Agilent 1290 Infinity UHPLC system via electrospray ionization (ESI) ion source with Jet-Stream technology for the LC/MS/MS analysis of Jiegeng samples. The ESI–MS spectra were acquired in both positive and negative modes. Ultra-pure nitrogen (N2) was used as the nebulizing and sheath gas. Product ion scanning experiments were conducted using ultra-high-purity N2 as collision gas. The ESI parameters were set as follows: the capillary voltage is 4.5 kV. The flow rate and temperature of sheath gas were 8 L/min and 350 °C, respectively. The flow rate and temperature of drying gas were 8 L/min and 300 °C, respectively. The pressure of nebulizer gas was 40 psi. The fragmentor voltage was 175 V. The mass analyzer scanned from 100 to 1700 (m/z). The Q-TOF acquisition rates were 2 and 3 Hz for full scanning and product ion scanning, respectively. The energies for collision-induced dissociation (CID) experiments were set at 10, 20, 30 and 40 eV, respectively. The Q-TOF mass spectrometer was tuned in the low mass range (from 100 to 1700 Da) and in the extended dynamic range mode (2 GHz). To ensure the mass accuracy and reproducibility, all MS data were acquired with reference masses at m/z 112.9855 and 966.0007 in the negative ESI mode, and at m/z 121.0508 and 922.0097 in the positive ESI mode. To compare the chemical compositions of sulfur-fumigated and air-dried Jiegeng samples, chemical profiling was conducted by UHPLC UHD Q-TOF MS in both positive and negative ion modes. 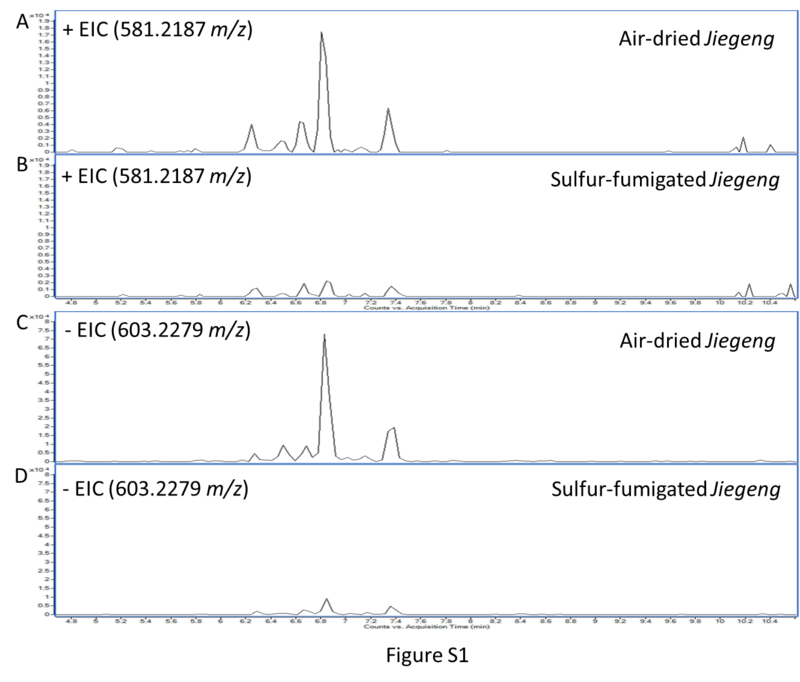 Two batches of air-dried Jiegeng samples (FX-JG-01, FX-JG-03) and their corresponding sulfur-fumigated ones (ZX-JG-02, ZX-JG-04) were analyzed using the established UHPLC UHD Q-TOF MS/MS method in this study. Within each sample group (air-dried and sulfur-fumigated), similar results were obtained from the two batches of samples. The results for samples FX-JG-01 and ZX-JG-02, which were from the same batch of fresh Jiegeng sample, were described and discussed in detail. The representative base peak ion (BPI) chromatograms of sample FX-JG-01 and ZX-JG-02 were shown in Fig. 1. It was found that the intensity of the major peaks (peaks 5, 7–23) detected in the air-dried Jiegeng sample (Fig. 1a, c) were obviously decreased or even disappeared in the corresponding sulfur-fumigated sample (Fig. 1b, d), whereas the peak heights of some components (peaks 1, 2, 3, 4, 6) were slightly higher in the sulfur-fumigated sample than in the air-dried sample. These results suggest that sulfur fumigation caused significant changes in the chemical profile of Jiegeng. For structural elucidation, the quasi-molecular ion peak of each compound was selected to obtain the product ion spectra with optimal collision energies (Table 1). Peak 2 showed a [M+Na]+ ion at m/z 419.1664 (C20H28O8) in positive ion mode and the ion could be further fragmented into ion m/z 257.1250 [M+Na–C6H10O5]+, the fragmented ions corresponded to the loss of one C6H10O5. Moreover, a [M+HCOO]− ion at m/z 441.1756 in negative ion mode generated fragments at m/z 305.1301 [M–H–C7H6]− and 215.1107 [M–H–C6H12O6]−, resulting from the losses of C7H6 and one glycosyl moiety, successively. Therefore, peak 2 was tentatively assigned as lobetyolin (2 in Fig. 2) and its identity was further confirmed by comparing the retention time and mass spectrum of reference standard. For peak 4, precursor ion [M–H]− was observed at m/z 1547.6719 (C69H112O38) with product ions at m/z 1415.6044, 1283.5692 and 1005.4878 representing the loss of apiosyl, xylosyl and rhamnosyl+arabinosyl moieties attached at C-28 of triterpenoid core, respectively. Therefore, peak 4 was tentatively assigned as platycoside E (4 in Fig. 2). Peak 6 (Fig. 3) displayed a precursor ion m/z 1255.5890 [M+H]+ and product ions at m/z 1123.5478 [M+H–C5H8O4]+, m/z 961.5037 [M+H–C11H18O9]+ and m/z 799.4424 [M+H–C11H18O9–C6H10O5]+, and was deduced as deapio-platycodin D2 (6 in Fig. 2). Peak 8 was tentatively assigned as deapio-platycodin D (8 in Fig. 2) according to the following facts. 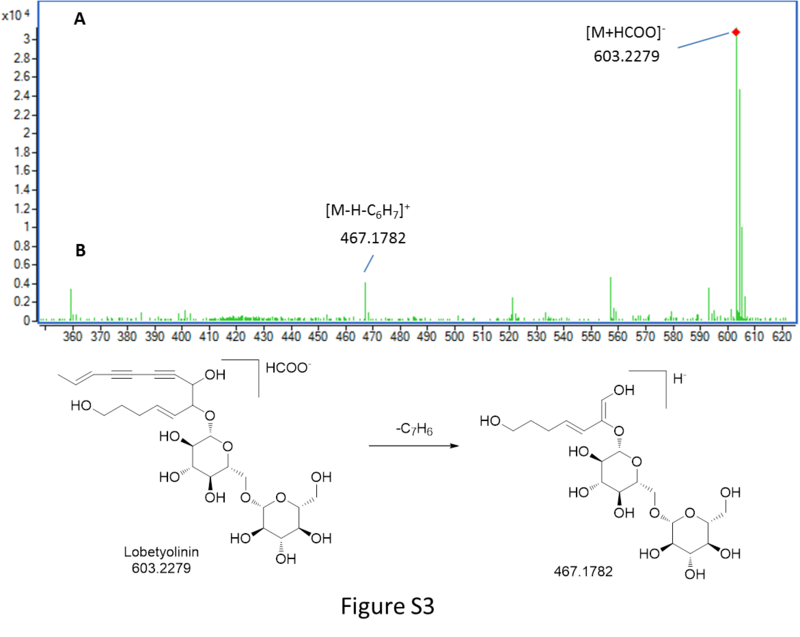 In positive mode, molecular ion m/z 1093.5400 [M+H]+ and the fragment ions at m/z 961.4949, 799.4453, 683.3975 and 521.3406 were due to glycosidic bond cleavage with sequential loss of xylosyl, rhamnosyl, arabinosyl and glucosyl moieties linked at C-28 and C-3 of the triterpenoid core, respectively. In negative mode, molecular ion m/z 1091.5265 [M–H]− and the fragment ions at m/z 959.4430, 681.3620 could be sequential loss of xylosyl and rhamnosyl+arabinosyl respectively . Peak 10 showed an [M+Na]+ ion at m/z 1247.5620 and [M–H]− ion at m/z 1223.5669 (C57H92O28). In TOF–MS/MS spectra, fragment ion at m/z 705.3831 [M+Na–C21H34O16]+ (positive ion mode), and fragment ion at m/z 681.3806 [M–H–C21H34O16]− (negative ion mode) were both resulted from the loss of apiosyl+xylosyl+rhamnosyl+arabinosyl moiety. Moreover, by comparing with authentic reference standard, peak 10 was identified as platycodin D (10 in Fig. 2). For peak 18 (Figs. 4, 5), molecular ion m/z 1135.5480 [M+H]+ and its product ions m/z 1003.5055 [M+H–C5H8O4]+, m/z 841.4540 [M+H–C5H8O4–C6H10O5]+, m/z 683.3916 [M+H–C18H28O13]+ and m/z 521.3454 [M+H–C18H28O13–C6H10O5]+ were observed in positive ion mode. Meanwhile, molecular ion m/z 1133.5336 [M–H]− and fragment ions m/z 1091.5205 [M–H–C2H2O]− and m/z 681.3849 [M–H–C18H28O13]− were observed in negative ion mode. Based on the literature information , peak 18 was tentatively assigned as platycoside C (18 in Fig. 2). For peak 21, precursor ion [M–H]− was observed at m/z 1265.5750 (C59H94O29) with product ion [M–H–C5H8O4]− at m/z 1133.5379 and [M–H–C23H36O17]− at m/z 681.3799 in negative ion mode. Comparing with literature , peak 21 was deduced as platycodin A (21 in Fig. 2). The polygalacin D (peak 14) (14 in Fig. 2) and 2″-O-acetyl polygalacin D (peak 23) (23 in Fig. 2) are dehydroxylated derivatives of platycodin D and platycodin A, respectively, yielding ion difference of 16 Da between two groups. 2″-O-acetyl polygalacin D (peak 23) and 3″-O-acetyl polygalacin D (peak 16) (16 in Fig. 2) are a pair of isomers with molecular weights of 1250 Da and produce the similar product ion spectra (Figs. 6, 7). Using LC-ESI MS/MS analysis and comparing with the chromatographic characteristics in literature , the two isomers were tentatively identified. Sulfur fumigation was reported to be able to cause chemical changes in herbs [16, 17]. In this study, chemical changes were observed in Jiegeng subjected to sulfur fumigation. Among all the compounds that showed significant changes, 23 constituents were deduced/tentatively identified. Structures of all the compounds were shown in Fig. 2. The peak heights of platycogenin A, platycodin D, platycodin D2, platycodin D3, polygalacin D, polygalacin D2, deapio-platycodin D and 3″-O-acetylplatycodin D2 in sulfur-fumigated Jiegeng were much lower than that in the air-dried sample; peaks of compounds platycodin A, platycodin C, platycodin V, platycoside C, 16-oxoplatycodin D, 2″-O-acetylpolygalacin D, 2″-O-acetylpolygalacin D2, 3″-O-acetylpolygalacin D, 3″-O-acetylpolygalacin D2, and platycogenic acid B disappeared after sulfur fumigation. On the contrary, the contents of syringin, lobetyolin, platycoside E, deapio-platycodin D2 and deapio-platycoside E slightly increased after sulfur fumigation. The decrease and disappearance of the glycoside compounds may be due to the hydrolysis of glycosides catalyzed by sulfurous acid (H2SO3) which was generated by the combination of SO2, the product of sulfur combustion, and the water molecule in fresh Jiegeng [3, 15]. For instance, the partial transformation of platycodin D2 to deapio–platycodin D2 may be caused by H2SO3-catalyzed hydrolysis of platycodin D2. On the other hand, H2SO3 produced during sulfur fumigation might inactivate glycoside hydrolases and then protect glycosides from hydrolysis in Jiegeng . This would partly explain why platycoside E and deapio-platycoside E, in which there are more sugar moieties than in other glycosides of Jiegeng, have relatively higher content in sulfur fumigated Jiegeng samples than in air-dried Jiegeng samples. It was reported that lobetyolin in Codonopsis Radix (Dangshen) could be changed to lobetyolin sulfate, which resulted in significant decrease of lobetyolin content in sulfur-fumigated Dangshen . In this study, peak height of lobetyolin in Jiegeng increased by sulfur fumigation. However, no peak in the base peak chromatograms of Jiegeng samples could be identified as a lobetyolin derivative. It has been shown that lobetyolinin could be hydrolyzed to lobetylin during sulfur fumigation . To determine if this occurred during sulfur fumigation of Jiegeng, we extracted the quasi-molecular ion of lobetyolinin in both positive and negative ion modes. A chromatographic peak at 6.83 min in the air-dried sample (Additional file 1: Figure S1) was observed and the fragmentation patterns of this peak agreed with that of lobetyolinin . In positive ion mode, quasi-molecular ion 581.2187 (m/z) [M+Na]+ (diff = −3.18 ppm) and the corresponding product ions at 419.1494 (m/z) [M+Na–C6H10O5]+ and 365.0885 (m/z) [M+Na–C14H16O2]+ could be seen (Additional file 2: Figure S2). In negative ion mode, quasi-molecular ion 603.2279 (m/z) [M+HCOO]− (diff = −2.57 ppm) and the corresponding product ions at 467.1782 (m/z) [M–H–C7H6]− were observed (Additional file 3: Figure S3). In sulfur-fumigated sample, the content of lobetyolinin decreased significantly, which can account for the increased content of lobetyolin (Additional file 1: Figure S1). The increased content of lobetyolin might be generated by hydrolysis reaction of lobetyolinin during sulfur fumigation (Additional file 4: Figure S4). Nevertheless, the chromatographic peak of lobetyolinin was masked in the base peak chromatograms of both air-dried and sulfur-fumigated Jiegeng samples due to the relative low content of this compound. Figures for the tentative identification of lobetyolinin and the possible mechanism involved in the transformation were provided as Additional files 1, 2, 3 and 4. Glycosides are the main bioactive constituents of Jiegeng, which have been shown to have various bioactivities. Significant decrease and/or loss of these glycosides caused by sulfur fumigation may negatively affect the bioactivities of Jiegeng. It has been reported that platycodin D, platycodin D2 and platycodin D3 have anti-HCV activity ; platycodin D is a potent adjuvant of specific cellular and humoral immune responses against recombinant hepatitis B antigen , and can reduce pancreatic lipase activity significantly . Whether the decrease in contents of these glycosides during sulfur fumigation will reduce the above mentioned bioactivities of Jiegeng remains to be explored. We also observed that contents of five glycosides (syringe, lobetyolin, deapio-platycodin D2, platycoside E and deapio-platycoside E) in Jiegeng increased after sulfur fumigation. These glycosides also exhibit various bioactivities. Syringe has immunomodulatory  and anti-inflammatory properties , can enhance glucose utilization and lower plasma glucose level in rats of insulin deficiency , and can alleviate fulminant hepatic failure (FHF) induced by LPS/D-GalN . Lobetyolin has significant antioxidant activity  and can activate NF-κB . Deapio-platycodin D2 is able to inhibit HCV activity . Platycoside E and deapio-platycoside E have hemolytic activities and adjuvant potentials on the immune responses to Newcastle disease virus-based recombinant avian influenza vaccine (rL-H5) in mice , and both showed antioxidant activities . It needs to be investigated if sulfur fumigation would enhance these bioactivities of Jiegeng. In the present study, an UHPLC UHD Q-TOF MS/MS-based chemical profiling method was developed to reveal sulfur fumigation-caused chemical alterations in Jiegeng. We found that sulfur fumigation resulted in significant changes of glycosides, the main bioactive components of Jiegeng. Further studies are warranted to determine the mechanism of the transformation of glycosides during sulfur fumigation and whether sulfur fumigation will affect the efficacy and safety of Jiegeng. XQM conducted the experiments and drafted the manuscript. SML carried out the identification of chemical components and drafted the manuscript. CLC participated in the optimization of liquid chromatography. TS and WDL participated in the collection of samples. HC critically reviewed the manuscript. WFF participated in the design of the study. ZLY conceived of the study, designed the experiments and finalized the manuscript. All authors read and approved the final manuscript. This work was supported by Grants FRG1/13–14/062 and FRG2/13–14/016 from the Hong Kong Baptist University, HKBU 262512 from the Research Grants Council of Hong Kong, HMRF11122521 from Food and Health Bureau of Hong Kong, and JCYJ20120829154222473 from the Science, Technology and Innovation Commission of Shenzhen, China. We thank Dr. Alexander Kai Man Leung from School of Chinese Medicine, Hong Kong Baptist University for his technical support and his help in the manuscript writing. The major equipment used in this study was substantially supported by a research Grant BCMRC/08-09/01-RDD from the Baptist Chinese Medicine Research Centre Limited. 13020_2016_101_MOESM1_ESM.png Additional file 1: Figure S1. Extracted ion chromatograms of lobetiolinin in Jiegeng samples. A, air-dried Jiegeng in positive ion mode; B, sulfur fumigated Jiegeng in positive ion mode; C, air-dried Jiegeng in negative ion mode; D, sulfur fumigated Jiegeng in negative ion mode. 13020_2016_101_MOESM2_ESM.png Additional file 2: Figure S2. Product ion mass spectra and proposed major fragmentation pathways of lobetyolinin in positive ion mode. A, low energy CID mass spectra; B, proposed major fragmentation pathway. 13020_2016_101_MOESM3_ESM.png Additional file 3: Figure S3. Product ion mass spectra and proposed major fragmentation pathways of lobetyolinin in negative ion mode. A, low energy CID mass spectra; B, proposed major fragmentation pathway. 13020_2016_101_MOESM4_ESM.png Additional file 4: Figure S4. Possible mechanism responsible for the transformation from lobetyolinin to lobetyolin.